Roleplaying in any game is a unique opportunity to escape into the lives of a constructed persona, to live lives of adventure and cunning, battle and espionage. Tabletop games especially, such as Dungeons & Dragons, provide yet another critical aspect to this vicarious living – social interaction. Whether physically surrounded by friends or strangers, or communicating by headphone over the internet, gaming allows players to create their own story instead of just reading one that is already written. The unpredictability of the campaign is what is so compelling and often addicting, since with every conversation or combat encounter, everything could completely change. When I first started gaming, as an actor I was thrilled at the opportunity to perform and take on the personas of my characters. I would often make dozens at a time, even if I would only end up playing one, just to feel the rush of creation. But the performance aspect of roleplaying turned out to be just the tip of the iceberg. By exploring the minds of the characters, I inadvertently discovered I was exploring my own mind as well. One thing I had begun to notice over the years was that no one makes a character without reason. Something about their personality or backstory appeals to the player, and the player often injects the same traits into multiple characters – often without noticing. This develops a core pattern of the mutual psychology of gaming. Simple put, characters become reflections of the players. Most often when I’ve brought this up to players, they were completely unaware of this. Some players make the same types of characters over and over, while others are all over the map with a few unifying traits. For example, a good friend of mine had a character whose father was addicted to painkillers and her goal was to find an “out” for him. I somewhat jokingly pointed out that all of her characters are either distanced from their parents, or helping them deal with addiction in some way. She later admitted that her real mother was currently suffering from addition and at risk of losing everything. She had never noticed the similarities in her characters until I said something. Because characters become an extension of the player’s psyche, there are times the player can feel exposed or agitated when that extension is pointed out. Recently I played with someone who created a drunken drifter with no motivation. When I as the Narrator started asking why the character fell into drink, what he was hiding from, and what he wanted to do before becoming a drink, the female player grew rather angry and admitted that there were “personal reasons” behind the character. Soon thereafter the player quit the group. Another player who expressed an interest in joining revealed an even darker side of human psychology. He asked if I’d allow a secretly evil character into the group, and this began a long discussion on why he felt butchering civilians and releasing plagues on innocent populations could be justified. I counter-argued, expressing my belief that because the rest of the party was good in nature they wouldn’t stand for it and would likely attack, abandon, or arrest his character. That’s when things started to get “real.” He compared the situation to real life and said, for example, “if we were best friends and I killed someone because he annoyed me, would you help me bury the body or coldly call the police despite everything we mean to each other.” This opened an entirely new can of worms. When I started discussing the fact that most humans have a moral and legal compass that would prevent them from assisting in murder, he claimed I had no concept of human psychology and promptly left. Needless to say it was a rather harrowing experience that made me realize just how deeply embedded psychology and mental relations are to the gaming experience. Over the years I seem to have attracted players who have many deep-seeded issues that we’ve been able to address and, in some cases, heal through roleplaying. It’s a calling and responsibility I don’t take lightly. I’ve learned not to ignore players others may consider problematic. Instead I do my best to understand why players play certain characters in certain ways, good or evil. Even the lack of motivation or depth of character speaks volumes to me. In my opinion, there are no lazy gamers. 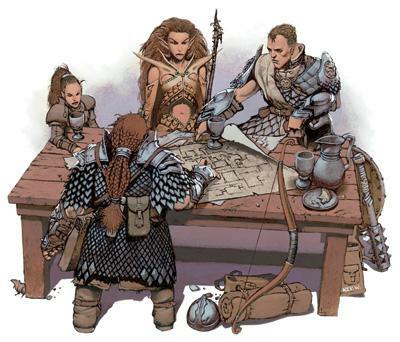 Players participate in roleplaying games to portray a character and interact with in a social environment, which takes dedication and initiative. So to go through the process of finding or forming a group, getting a character created, and then keeping up with them on a weekly basis, having a background such as “his family was killed, and now he just drinks and takes up mercenary work all day” says to me that the player has issues delving into their own psyche. That’s why the character has none to probe. So, by chipping away at the lone-wolf, murder-hobo exterior of two-dimensional characters, it’s entirely possible to uncover a cavern of suppressed emotions, personal history, and family life. While I personally don’t force any player to self-analyze, nor do I recommend others press the issue, it’s worth noting that every character is in fact a manifested mask covering the face of the player. Some are comical, some serious, some valiant, some violent – but all are worth seeing with new eyes and an open heart. This is a fantastic post and welcome to the blog! As I was reading I started analyzing the characters that I create in RPg’s. It’s funny because until recently, I would always make the same character. I finally branched out and tried other variants and I can see why I was so stuck on the same character psyche for so long. Really amazing job! Awesome post! There was a time when I would tease my players for always making the same kind of characters in RPGs, but ultimately what you’ve said here is a strong explanation for why that happens: they are playing what appeals to them because of their own struggles and interests in life. I, for example, often find myself playing characters who are Chaotic in alignment, but I feel like that’s a reaction to the fact that I am always so Lawful in my real life and I want to experience that freedom to do things without so many constraints. Roleplaying games are awesome because they allow us to express those parts of ourselves that may not get to show in real life, for one reason or other. Hey, great post. You made me really think about how I roleplay in many videogames of mine. Usually I play as a character who requires a lot of guidance and is reluctant to be a lone wolf. I didn’t realise, until you made me think of it, how this mirrors my personality, in a less dramatic way obviously, in real life. Very thought-provoking post. I often skip character customisation and backstory thought and just start playing but if it’s a game with a karma system I start multiple characters to try every different alignment. After reading your post I started thinking and have come to the conclusion that I don’t really care about myself much but my motivation is curiosity and a desire to see everything on offer, thank you for that.